Completing the assembly manual has taken me longer than I had planned and I am hearing from some “CLEARWOOD” board builders that are nearly ready to strip the bottom and close up the shell of the board. So let’s go through the basics of what we need to consider before stripping the bottom and closing up the shell. We’ll start with the blocking that supports and reinforces the fin(s), vent and leash plug. All three of these components should be installed on both touring/race boards and surf style boards. All hollow boards should have all three of these blocking components installed prior to closing up the shell of your board. Some builders may ask why they would need a leash on a board intended for touring. This is a fair question, but think of what would happen if you became separated from your board in really windy conditions. Boards move quickly in the wind….likely quicker than you can swim so even though you may not use a leash every time you paddle, there will be times when using a leash is essential for your safety. The fin is obviously a critical part of a paddle board. It is essential to keeping you on course and tracking straight. The lateral loads from pressure on the fin can be quite concentrated and therefor the fin(s) needs to be securely anchored to the structure of the board. I recommend blocking both sides of the stringer (for the center fin) from three inches forward of the tail end of the board continuously to a point 2″ forward of the forward end of the finbox.. I use 1” thick material for this blocking and make the block the full depth of the stringer. This will lock the finbox/fin assembly solidly into the framework and skin of the board giving you plenty of material from which to route a pocket for the fin box. For surf style boards, the position and length of the fin boxes you choose will determine the position of the blocking so you will need to plan your fin layout and finbox choices prior to “close up”. You will notice that in the photo above that the bottom went on first and that the deck went on last. This board was built prior to developing the “rocker tab” system. I’m showing you this photo to illustrate the blocking layout. This board is a surf style and was set up as a quad + one. You can also see the vent block which was installed the full depth of the board but in this case the vent block was notched to allow for pressure relief. This is a good example of the multiple ways there are to address any particular situation with the construction of a hollow board. In reality my system evolves. The main idea to keep in mind are the basic principals regarding structure, venting and sealing prior to close up. The leash plug is another component that can be subjected to quite high loading. Blocking that is securely glued to a cross (transverse) frame and skin of the board is one of the keys to avoiding leash cup failure. The plugs that I make and most plastic plugs made commercially are in the range of 1” – 1 ¼” in diameter. I recommend using a block that is a minimum of 2” x 2” and is the full depth of the board at the point of placement. The placement position can vary but in general, leash cups are installed near the tail of the board on one side or the other of the stringer. Since this block and all the other blocks necessary on the interior of your board are installed after you flip the board and before you strip the bottom, you must mark the center of the leash cup and vent blocks PRIOR to installing the bottom strips. The simplest way I have found to mark the center of the leash plug block and the vent screw block is to drill though the block from the bottom side all the way through to the deck of the board. I use a 1/16” diameter bit for this hole. This hole/ “mark” on the face then becomes the pilot hole when you get to the point of drilling the pocket holes for the leash cup and vent screw body and it can’t be sanded off. The vent screw block set up is slightly different since the vent needs to be open on the bottom (inside of the board) in order to work as a pressure relief vent. This vent is typically slightly less deep than the body of the vent screw is long. There are also different lengths of vent screw body’s so you will need to measure yours to determine the depth of the block. If the block ends up being deeper than the vent body is long, it isn’t a big problem since you will be drilling through the block from the deck side. Just remember to not make the vent screw block the full depth of the board or it won’t be able act as a vent. At the time you “flip” your board you will have the deck and some of the rail in place. Before you begin the process of completing the rail strips and installing the bottom strips you will want to seal the interior that is now in place. From this point in the process of installing strips, the pieces should be pre-sealed since there won’t be any way to seal the inside after all the strips are in place. There are several choices of material you can use to seal the interior, from thinned epoxy to marine varnish to exterior grade acrylic polyurethane. I apply a thinned epoxy solution to all of the interior surfaces including the framework. The reason I use thinned epoxy is because it is compatible with the epoxy I use to glue the strips in place. The consideration in this regard is that the gluing surfaces on the framework need to maintain “glue-ability”. 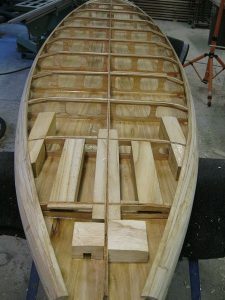 Epoxy sticks to epoxy which has penetrated the fibers of the wood but would not adhere well to marine varnish, for example. If you are using a Titebond or polyurethane product you would not want to apply a sealer to the glue surfaces on the framework since the bonding strength would then be compromised. My system for sealing the pieces from this point to completion is to seal the strips prior to ripping them to width. By so doing, you will then have strips with fresh wood uncontaminated by sealer. If you are sealing your strips with thinned epoxy and installing strips with epoxy the surface contamination of the strips is not a problem but it is important to consider your sealers and glues as a “package” that needs to be coordinated for proper adhesion. Another item for consideration throughout the close up process is how to keep the interior of your board clean and “rattle free”. This isn’t an issue until the point where you can no longer get the “snout” of your shop vacume hose into the board. There is no easy solution here other than vigilance. My first board was full of wood chips that I get reminded of every time I pick the board up….rattle, rattle, rattle! You just have to be really careful to keep the interior clean as you approach the point on “no return” with the vac hose. That’s about it for this session. If anyone has further questions or needs clarification email me or call me and we’ll sort it out.